AMHERST, Mass. – When researchers at the University of Massachusetts Amherst led by microbiologist Derek Lovley discovered that the bacterium Geobacter sulfurreducens conducts electricity very effectively along metallic-like "microbial nanowires," they found physicists quite comfortable with the idea of such a novel biological electron transfer mechanism, but not biologists. "For biologists, Geobacter's behavior represents a paradigm shift. It goes against all that we are taught about biological electron transfer, which usually involves electrons hopping from one molecule to another," Lovley says. "So it wasn't enough for us to demonstrate that the microbial nanowires are conductive and to show with physics the conduction mechanism, we had to determine the impact of this conductivity on the biology." "We have now identified key components that make these hair-like pili we call nanowires conductive and have demonstrated their importance in the biological electron transport. This time we relied more on genetics. I think most biologists are more comfortable with genetics rather than physics," Lovley adds. "From my perspective, this is huge. It really clinches a big question. We overturned the major objection the biologists were making and confirmed the assumption in our earlier work, that real metallic-like conductivity is taking place." Findings are described in an early online issue of mBio, the open-access journal of the American Society for Microbiology. In addition to Lovley, the UMass Amherst team includes first author Madeline Vargas, with Nikhil Malvankar, Pier-Luc Tremblay, Ching Leang, Jessica Smith, Pranav Patel, Oona Snoeyenbos-West and Kelly Nevin. 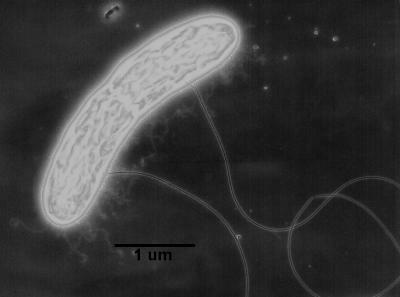 In 2011, Lovely's group discovered a fundamental, previously unknown property of pili in Geobacter. They found that electrons are transported along the pili via the same metallic-like conductivity found in synthetic organic materials used in electronics. Electrons are conducted over remarkable distances, thousands of times the cell's length. But exactly how the pili accomplished this wasn't clear. The bacterium Geobacter sulfurreducens conducts electricity very effectively along metallic-like pili dubbed "microbial nanowires" by discoverers at UMass Amherst. They recently determined the impact of this conductivity on the biology of the bacterium, confirming an assumption in their earlier work that real metallic-like conductivity is taking place. They knew that the conductivity of synthetic conducting organic materials can be attributed to aromatic ringed structures which share electrons, suspended in a kind of a cloud that allows the overlapping electrons to easily flow. It seemed possible that amino acids, which have similar aromatic rings, might serve the same function in biological protein structures like pili. Lovley's team looked for likely aromatic amino acid targets and then substituted non-aromatic amino acids for the aromatic ones to see if this reduced the conductivity of the pili. It worked. The re-engineered pili with non-aromatic compounds substituted for aromatic ones looked perfect and unchanged under a microscope, but now they no longer functioned as wires. "This new strain is really bad at what Geobacter does best," Lovley says. "Geobacter is known for its ability to grow on iron minerals and for generating electric current in microbial fuel cells, but without conductive pili those capabilities are greatly diminished." "What we did is equivalent to pulling the copper out of an extension cord," he adds. "The cord looks the same, but it can't conduct electricity anymore." The ability of protein filaments to conduct electrons in this way not only has ramifications for scientists' basic understanding of natural microbial processes but practical implications for environmental cleanup and the development of renewable energy sources as well, he adds. Lovley's UMass Amherst lab has already been working with federal agencies and industry to use Geobacter to clean up groundwater contaminated with radioactive metals or petroleum and to power electronic monitoring devices with current generated by Geobacter. His group has also recently shown that Geobacter uses its nanowires to feed electrons to other microorganisms that can produce methane gas. This is an important step in the conversion of organic wastes to methane, which can then be burned to produce electricity. As more states, including national leader Massachusetts, pass laws to prevent hospitals, universities, hotels and large restaurants from disposing of food waste in landfills, Geobacter's role in producing methane could be part of the solution for how to deal with this waste. The Massachusetts law goes into effect in 2014. "Waste to methane is a well developed green energy strategy in Europe and is almost certain to become more important here in Massachusetts in the near future," Lovley notes.